We love to find games that are great for kids. Captain Squiddy's Jigsaw Quest came across our path and it looked fantastic. I put in our review request, and this iPad game came in. Family Friendly Gaming loves to try kids games on real children. You would be amazed how many things children find in games that an adult would not notice. Captain Squiddy's Jigsaw Quest is a fun little game that has players on a pirates quest. The pirate is a squid. The graphics in Captain Squiddy's Jigsaw Quest are bright and colorful. Children put colored pieces on top of the less colored background. We only ran into problems with one of the puzzle pages. That was because we did not comprehend the scene was changing. The animation on the world screen is great. I love how nice this little sea area looks. The islands, the ship, and more look fantastic. Kids love pirates. Kids also love ninjas, but that is not a part of this game. The squid makes a fantastic pirate, and with no violence. How great is that? Kids learn to follow the game from place to place. At the end they discover a treasure. I will not spoil that for you. The special effect sounds and the music is amazing for a ninety-nine cent game. The voice actor is another story. In fact there were a few negative comments about that facet of this iPad game. In fact it was the only negative comments. Most kids games cheapen out in terms of bonus features. 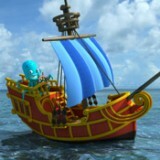 Kids collect coins in Captain Squiddy's Jigsaw Quest which are redeemed at the lobsters store. There are some really cool goodies that can be purchased in his store. All the music, all the puzzles, etc. Family Friendly Gaming was provided a download code to review Captain Squiddy's Jigsaw Quest. With that said I believe this app is worth the price. Kids will enjoy completing the puzzles and sailing around the islands. Our six year old was able to quickly learn how to play Captain Squiddy's Jigsaw Quest, and to complete puzzles. He never once needed any assistance from me. I am very proud of him for beating this game. He was also pleased with the treasure in the treasure chest. As an adult I actually found myself enjoying the puzzles in Captain Squiddy's Jigsaw Quest. They are not challenging to my age bracket but that is okay. It is not meant to be. Sometimes it is great to enjoy the simpler things in life. The main lesson in Captain Squiddy's Jigsaw Quest is matching. Find where each piece belongs, and put it in the right spot. There are also verbal directions in this game that the child must follow to progress to the next area. I love the characters in Captain Squiddy's Jigsaw Quest. There is a lot of creativity that went into this hand held title. I hope to see sequels in the future.